CONFIRMATION PAGE - This is the page where the client is redirected after submitting their proofs to you. This page requires the Oops! 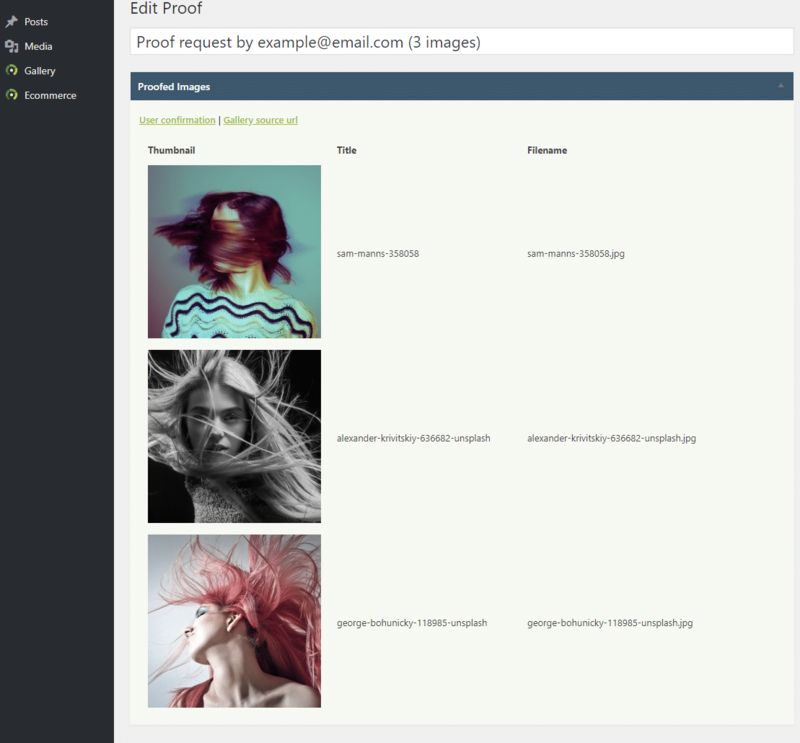 This page usually displays details for image proofs, but you have not proofed any images yet. Please feel free to continue browsing. Thanks for visiting. shortcode, which will be automatically added if not already present. Selecting 'Create new' will create a new page that will appear in your Primary Menu unless you've customized your menu settings under Appearance >> Menus. TRIGGER TEXT - by default this will say 'Submit Proofs', but you can enter in your own text here which will be the submit button under your proofing gallery. NOT FOUND MESSAGE - this message appears when someone is viewing the confirmation page without a collection of images submitted for proofing. CONFIRMATION TEMPLATE - This is the template that generates the text and layout for your confirmation page that the client sees after submitting their images to you. You can leave this as is, or customize it to fit your needs. Possible substitution fields: user_name, user_email, proof_link, proof_details. These need to be wrapped with %% as shown in the default template text. 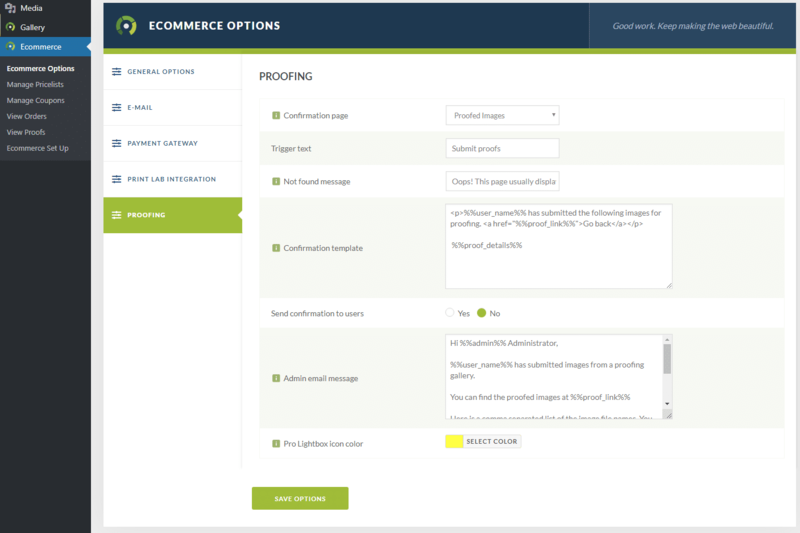 SEND CONFIRMATION TO CLIENT - Optionally you can choose to send a confirmation email to your client with a link to their confirmation page listing the images they selected for proofing. This can serve as a 'receipt' and confirmation that their submission was successful. 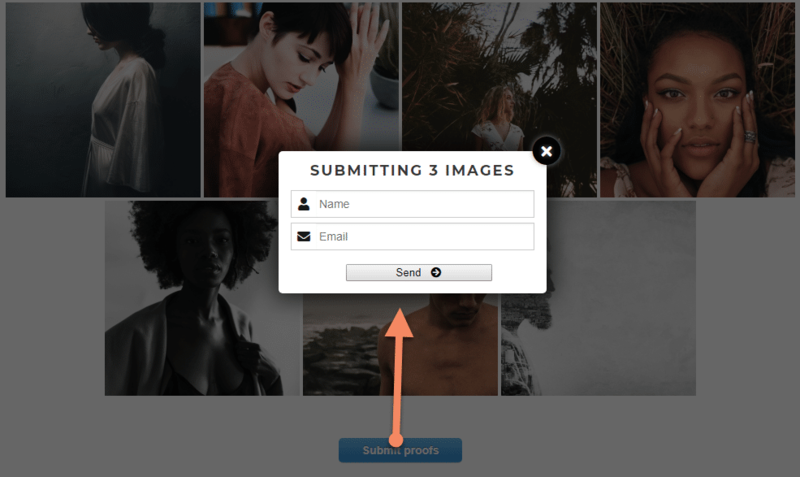 CONFIRMATION EMAIL - This is the template that generates the text and layout for the confirmation email your client will receive after submitting their images. You can leave this as is, or customize it to fit your needs. Possible substitution fields: user_name, user_email, proof_link. These need to be wrapped with %% as shown in the default template text. ADMIN EMAIL MESSAGE - This is the template that generates the text and layout for the confirmation email you receive after your client submits their selection of images. You can leave this as is, or customize it to fit your needs. Possible substitution fields: admin, file_list, proof_link, user_name, user_email. These need to be wrapped with %% as shown in the default template text. 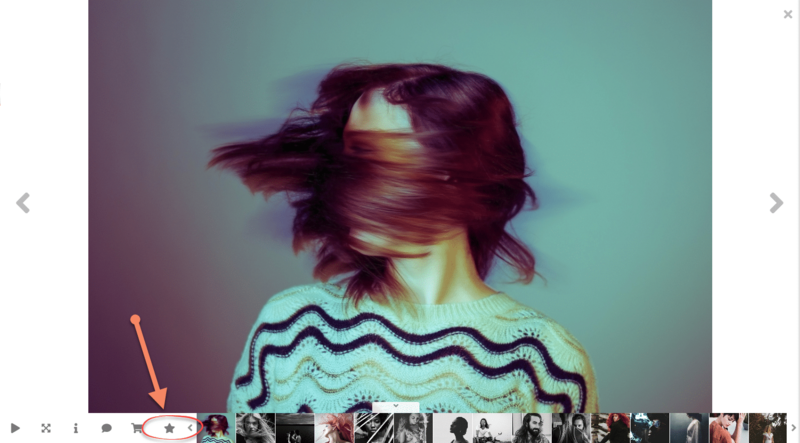 PRO LIGHTBOX ICON COLOR - Choose the color for the star that your clients select when selecting their images. 1) Follow the steps outlined here to create your gallery: Adding Galleries. - When inserting your gallery via the Add Gallery Window, under the 'Customize gallery display' tab select 'Enable proofing'. - Click 'Save' and then 'Publish' / 'Update' your page or post. 2) Once enabled and the page is published you will see a star icon appear at the bottom of the Pro Lightbox. If you have a gallery display like Pro Thumbnail or Pro Film, and 'Trigger Icons' enabled under 'Customize display settings' in your Add Gallery Window, a star will also appear below each thumbnail.